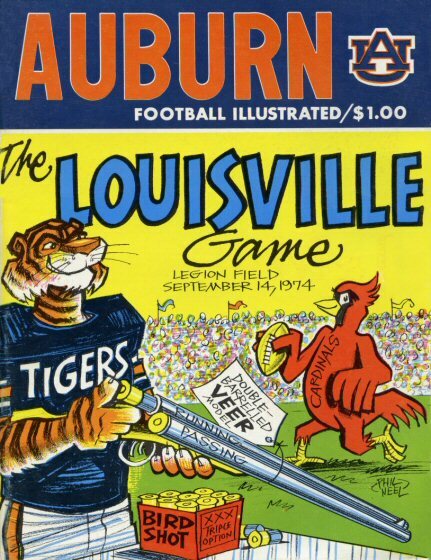 Auburn and Louisville have met once before. It was 1974 in Birmingham, and it was kind of a big deal … because it was such a small deal. As in literally small, at least if we’re talking crowd size. And that’s all really anyone could talk about after the game, which had the lowest attendance of any Auburn game stretching back 20 years before and stretching forward 41 years and counting. Season opener. Out of conference. Decent opponent. In the Football Capital of the South. Not on TV. How many saw it? 25,000—and they were even thankful for that. The week of the game, ticket sales were only at 13,000. Auburn Athletic Director Jeff Beard and Ticket Manager Bill Beckwith were rubbing their eyes, scratching their heads. Had Auburn been that that bad in 1973? Well, yes, but still—25,000? Those were spring game numbers. It was so bad, they had Shug go on the radio and beg people to come. Well, not beg; Shug didn’t beg. But that a nationally respected coach of a nationally respected program felt the need to go on the air to urge fans to support their team for the first game of the season, for the unveiling of what was supposed to be an exciting, potent new offense (the Veer—here’s how it looked against Miami)… well, the optics just weren’t good. It seemed like begging. It seemed kind of pathetic. Second-year Louisville coach T.W. Alley was selling it as a David versus Goliath matchup, the one his predecessor Lee Corso had first suggested two years earlier against an Auburn team that might have even played the underdog against a Cardinals squad that wound up two points away from a perfect season. Goliath won in ’74, but it wasn’t pretty. Understandably, the team seemed to play down to what appeared to be the less-than-great expectations of its fans. The thing was tied 3-3 with four minutes left. Auburn quarterback Phil Gargis managed to crank it up a bit right at the end, sneaking in for a couple of late touchdowns (one after a Louisville fumble at their two). But though they eventually got it together so well it was praised in song, the Veer, in it’s debut, looked like rear. Thankfully, at least not many people saw it. But despite the insignificant attendance—or rather because of it—the ’74 Louisville game resulted in a significant course correction in Auburn’s approach to scheduling. Or at least Mark Murphy (that Mark Murphy) would probably like to think so. 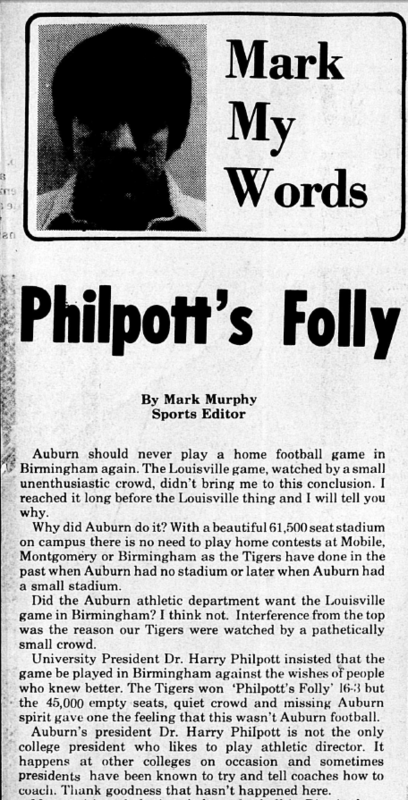 In a scathing column, Murphy, sports editor for the Plainsman that year, wrote that he hoped the embarrassment of a top SEC program playing before a crowd a junior college wouldn’t have been happy with, a crowd that would’ve been deemed pathetic by Auburn standards even 20 years earlier, would inspire the powers that be to make sure it never happened again. By never, ever, ever again playing a home game in Birmingham. Nope, it wasn’t some neutral field, kickoff classic. This was an Auburn home game … just two hours away from home. It’s just the way it used to be. Not every home game, but some of the bigger ones–Mississippi State, Tennessee and of course Bama. Auburn had opened the 1973 season against Oregon State at Legion Field. Forty-five thousand showed up for that one. And they thought that was bad. Auburn had already taken a big, big step in the right direction. Tennessee, an elder statesman of the Jordan-Hare holdouts, was finally coming to the Plains that year. When they got there, 64,000 people were waiting on them. Heck, the were 42,000 at the home opener played the week after the Louisville game… and that was against Chattanooga! So why, Murphy wanted to know, did Auburn (specifically, at least in this case he thought, AU President Harry Philpott) insist on throwing its pearls to the Astroturf-loving Bamaham swine who didn’t even want them? And Auburn did. Lesson learned. 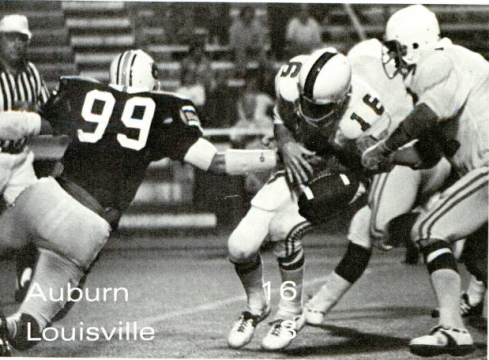 Auburn (inexplicably) played Tennessee “at home” in Birmingham in 1976 and 1978. But other than Bama (because of contracts and such), that was it. 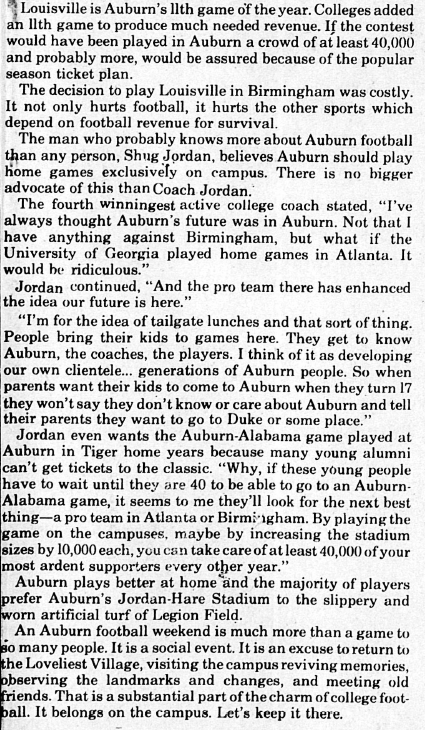 Shug was actually talking to Murphy about bringing the Iron Bowl to Auburn, even back then. So can you kinda sorta credit the 45,000 empty seats at the 1974 Louisville game at Legion Field with the record-setting crowd at the 1989 Iron Bowl at Jordan-Hare Stadium?